Cloudiway’s Teams and group migration solution helps businesses perform technical migrations through a simple SaaS interface. As a result, Teams and group migrations require no additional software installation or overhead, and migrations can be performed securely and quickly. We take your privacy and security seriously at Cloudiway, and we have invested significant effort into making our platform and your data secure. Cloudiway provides a cloud-based application hosted in Windows Azure. It means that the software and data are centrally hosted and accessed by clients using a web browser and internet connection. In addition, Cloudiway’s SaaS benefits from Windows Azure’s certifications, ensuring security of the infrastructure, network and physical security layers of the Cloudiway cloud. *For the delta pass mechanism, a reference ID of each data migration is stored in internal caches (SQL databases) with the date of modification. This ensures that no data is duplicated, and for efficiency, only the changes are propagated. We automatically delete inactive records after 90 days, or upon request. In addition, because the Cloudiway platform needs credentials to connect to the source and the target, you define connectors to connect to them and enter credentials that will be used for the connection. These credentials are stored encrypted using AES 256. For complete peace of mind, we recommend that you create a temporary migration account during your migration which you can delete at the completion of your project. Cloudiway’s software platform has been designed and developed to support large migrations. The on-demand migration engine is able to allocate the migration capacity that you need to migrate the volume of data of your choice in the time slot that you have allocated for your migration. Please bear in mind that Office 365 can heavily throttle users. When you perform too many calls, Office 365 begins throttling and decreases the number of calls that can be performed each minute, thus reducing the migration throughput. Cloudiway constantly attempts to work at the maximum capacity allowed by Office 365 and is able to achieve excellent throughput. 4.1 What can be migrated? Groups and Teams are recreated. The associated SharePoint Modern Site is created. The flag Public / Private is migrated. Owners and Members are migrated. The SharePoint Site is migrated. The associated mailbox is migrated. Channels (for Teams) are recreated. Metadata (date of creation, modification, creator, modified by on files and site items are migrated). MetaData on conversations are not migrated. ToolBar is currently not migrated (may be migrated in a near future). Delta migration is a Cloudiway functionality that allows you to migrate incrementally. Changes are migrated during delta passes. Deletions are not propagated. This guide is aimed at experienced system administrators who are capable of connecting to remote systems and using a variety of administration tools. Although we provide support for our own products, we do not provide support for third-party products such as PowerShell or server administration of Microsoft products. If you are concerned you might have any difficulty completing these steps, please consider a solution with our consulting team, contactable via presales@cloudiway.com. This will ensure a fast, cost-effective and stress-free implementation. Before you start, you will need to ensure you have the details outlined in the following table. with admin access, especially for migration. To ensure successful migration, we recommend that you follow the checklist. Prepare any mapping tables for users and groups in CSV format, ready to upload later on. You need a tenant administrator account to setup the permissions. Migration uses a mix of Graph Apis and CSOM calls. Graph APIS permissions requires application permissions on groups, users and sites. Group.Read.All, Group.ReadWrite.Alls, User.Read.All, Directory. Read.All. For CSOM access, the migration account must be SharePoint administrator. The migration account must have a license and must have logged to his mailbox at least once. 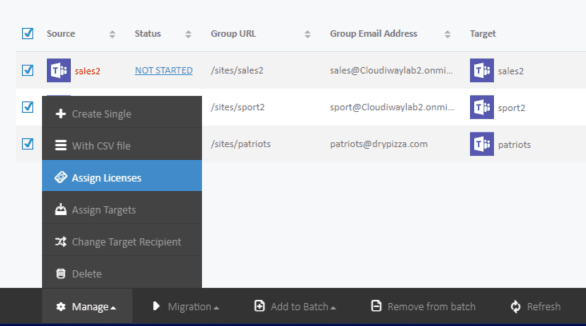 To facilitate the groups and teams migration, the Cloudiway platform needs to be able to communicate with both your source and target domains. To do this, Cloudiway uses connectors, which are configured on apps.cloudiway.com. You will need to set up a connector for each source tenant and each target tenant. Follow the steps below to configure a source connector. You can choose to manually set up your connectors, or you can use the simpler process of the wizard. The steps below will walk you through the manual process. 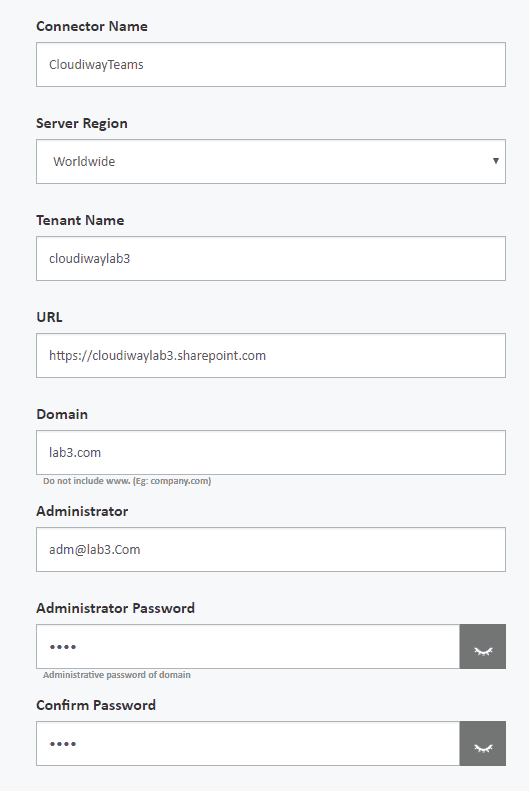 Name of the tenant: enter the name of your tenant (ie cloudiwaylab), not cloudiwaylab.com or cloudiwaylab.sharepoint.comFilling this field automatically fills the URL field. Server Region: Most of the time, keep the default value “Worldwide” except if you have a China, German or US Governmental tenant. Domain Name: Enter the name of your primary domain. 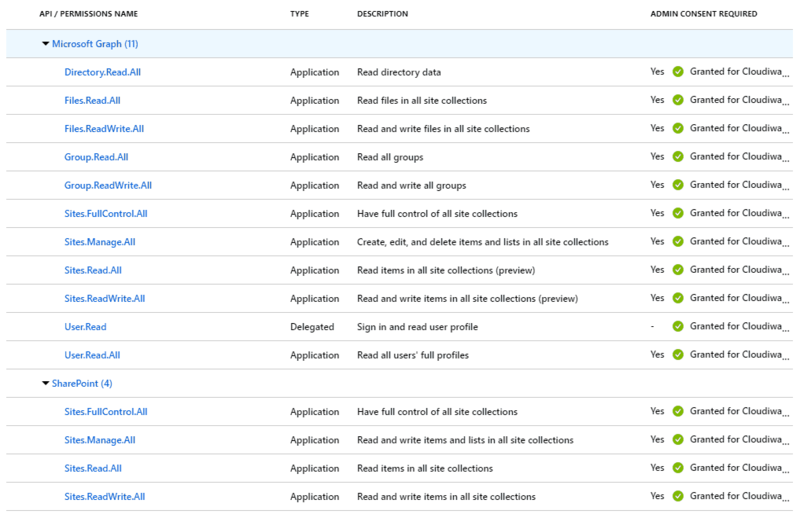 Migration User: A sharePoint administrator account ( for permissions to run CSOM calls). 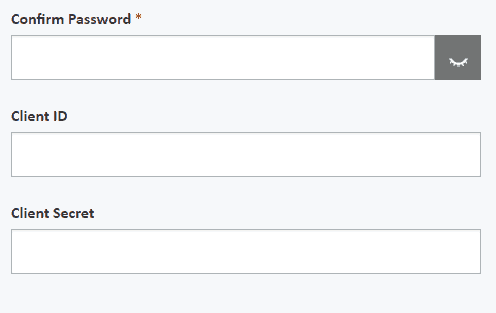 User Password: The password of the migration user. This is stored encrypted in EAS 256. With the source connector now configured on the Cloudiway platform, it’s time to create and configure the target connector. 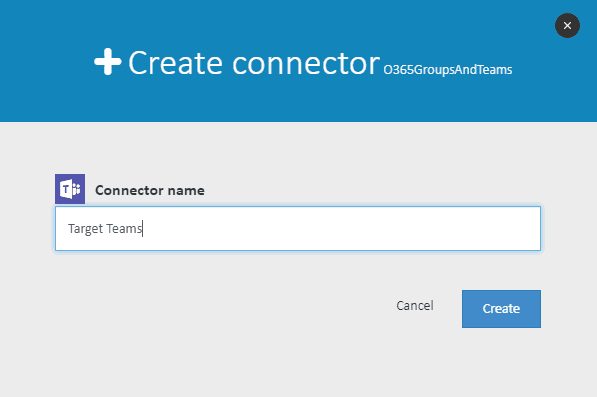 Follow the steps below to configure an Office 365 Group / Team target connector. Click on Targets on the left, then + New on the Action bar at the bottom of the screen. 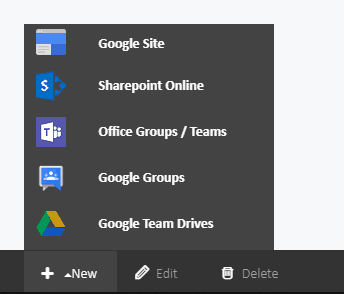 Click on Office Groups / Teams Online and type a meaningful name in Connector name. Click on the Save button at the bottom of the screen. 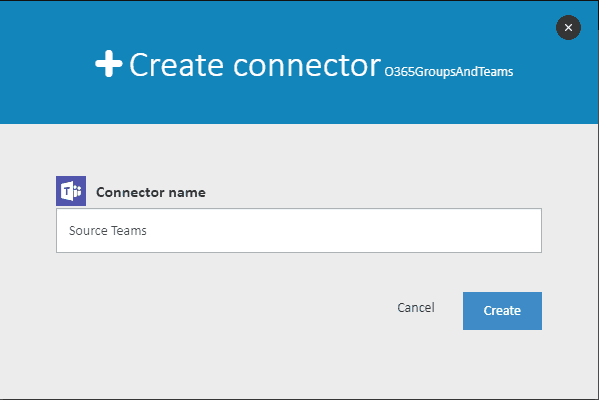 The Cloudiway platform provides a tool called Get Groups / Teams which returns a list of all groups and teams from the domain you added to the source connector. This is a useful tool which provides you with a complete picture of groups and teams to be migrated. You should therefore run this tool prior to group/teams. The tool will schedule a call to your domain to return a list of all visible Groups and sites for migration. 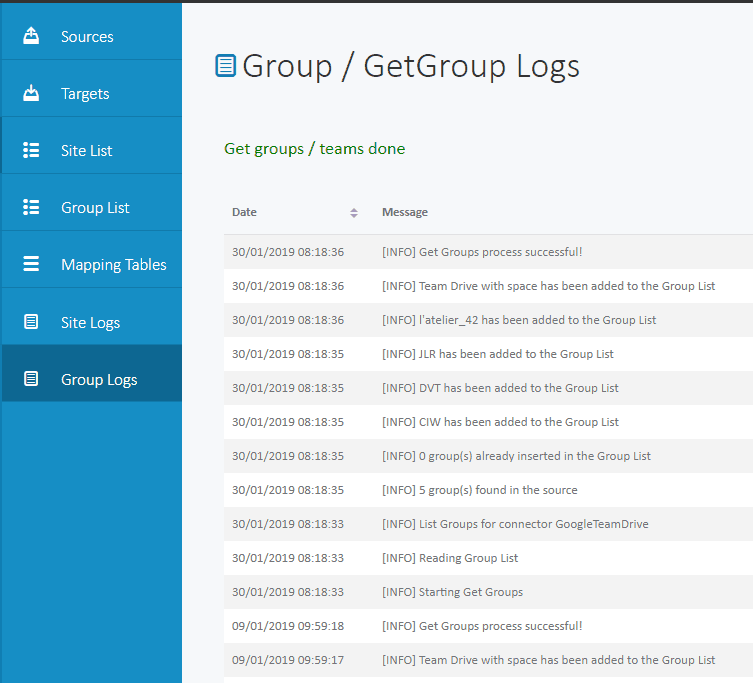 Once the Get Groups / Teams tool has completed, it will return a list of all groups and teams discovered via the source connector’s credentials. The list will appear in the Group List area of the Cloudiway platform. 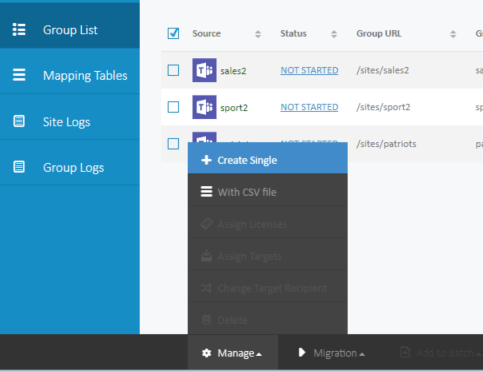 From this list, you can check what is due to be migrated prior to migration, edit the group definitions, assign licenses and delete any group or team that don’t need to be migrated. These actions are explained in the following sections. You can also download the results in CSV format for your own records or to make editing changes, and then upload the updated CSV file to the Cloudiway platform as your final list to be migrated. Note: you cannot add new entries to the CSV file: they must exist on the Cloudiway platform already. 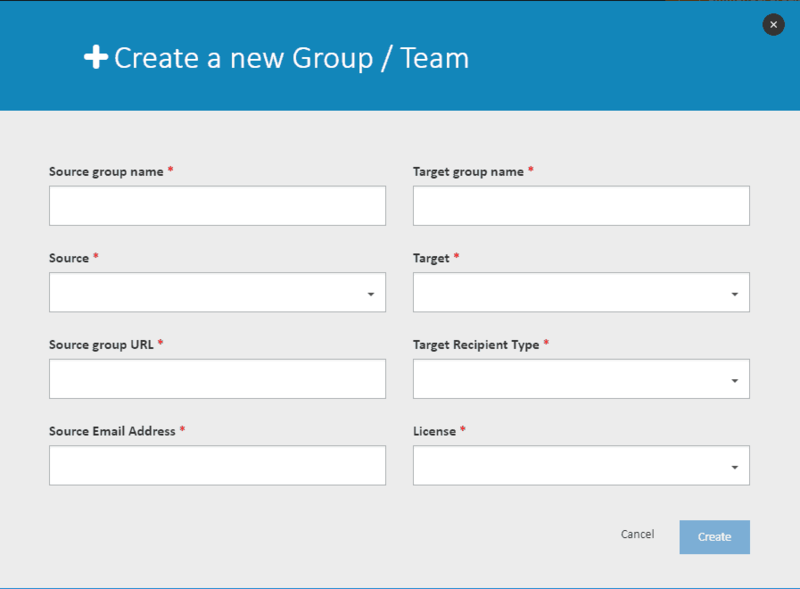 If you need to add a new group or team, either re-run the Get Sites (which will add newly-available sites to the existing list) or add a group or team manually using the steps in section 6.6. 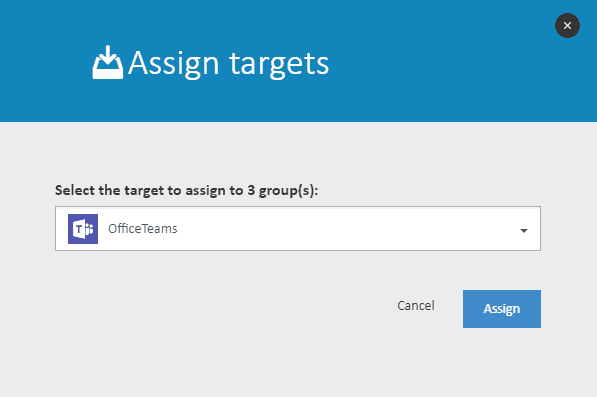 From the group list, select the groups and teams of your choice and click on Manage / Assign Targets. Select your target from the dropdown list and click on the Assign button. In the same way you assigned the targets, now assign the licenses. From the group list, select the groups and teams of your choice and click on Manage / Assign Licenses. You can manually edit the details of the group or team. For this, click on the line to edit it. Due to the possibility of typos, we recommend you only use this option if it’s impossible to rerun the Get Groups command. 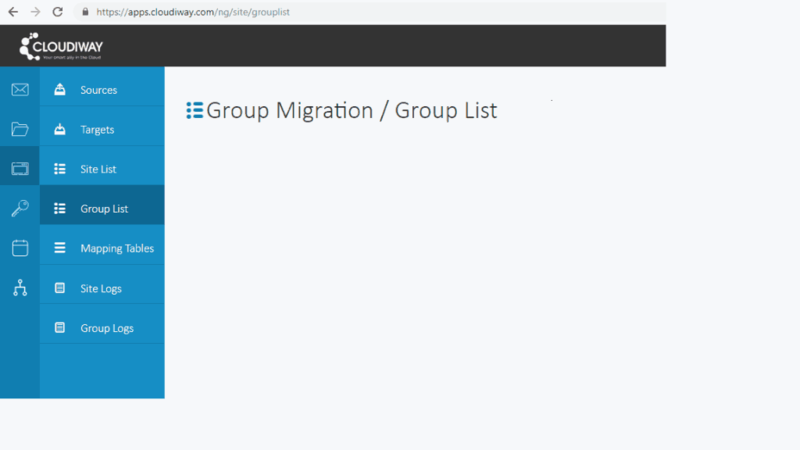 Ensure you’re still in the Site & Group Migration area of apps.cloudiway.com and go to Group List. Click on Manage / Create Single. Source name: Name of the Group or Team.Source: Select the source connector.Source URL : Enter the relative url of the SharePoint modern Site.Source Email Address: Enter the email address of the group or team.Target Name: Enter the name of the group in the target.Target: Select the target connector.Target Recipient Type: select the type of target object: This can be a group, a shared mailbox or a team.License: Assign a license. In order to migrate permissions and metadata (createdby, modifiedby, etc…), a mapping table of users must be defined. A list of mail users is used as mapping tables as it defines who has access to the different sites. It is also used to migrate metadata for files and folders. You can upload a user or group list via CSV, use Cloudiway’s automated Import Users tool, or manually add each user on the Cloudiway platform. If you perform more than one upload, any CSV data already uploaded will not be overwritten by following uploads. Therefore, duplicates can occur. 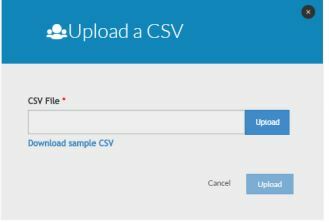 Sample CSV files are available to download during the steps below. 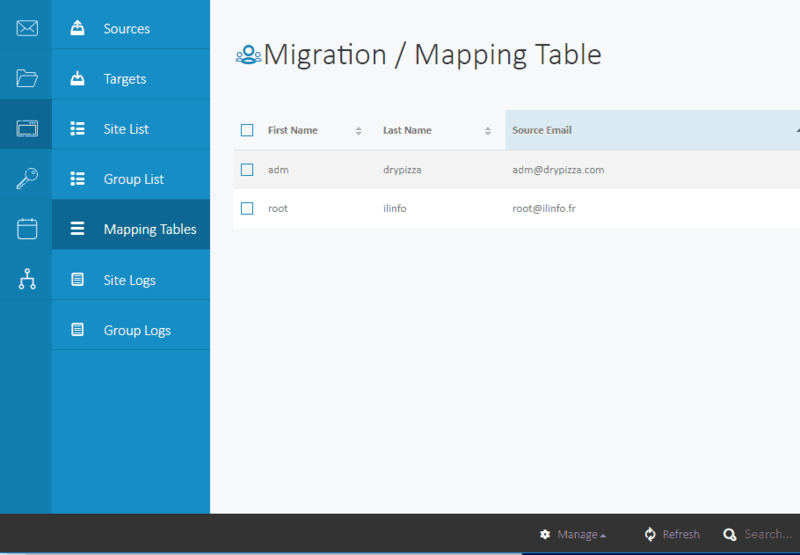 From the Site Migration area of apps.cloudiway.com and go to Mapping Tables. Click on Manage on the action bar and select Upload CSV. When you have a complete CSV file with the correct headers, click on the Upload button. If you see any error messages, check your CSV file to ensure it has four columns each with a separator (including the last), and try uploading again. To upload a group CSV, click on the Groups tab in the top right corner and repeat steps 2 to 6. Check your email for confirmation that all uploads have been completed: you can also refresh the Cloudiway platform to display your imported users at any time. If you wish to edit any user or group that’s been uploaded, click on their name from the user list or group list to display the editable list of fields. Many of our first-time customers create a single user and/or group for testing purposes. This provides a means of watching the migration process without affecting all users. Single users and groups can also be created for migrations affecting just a few users. Repeat steps 1 to 4 for any more users you’d like to create. If you’d like to manually add a group, click on Groups in the top left corner of the screen, then repeat steps 2 to 5. 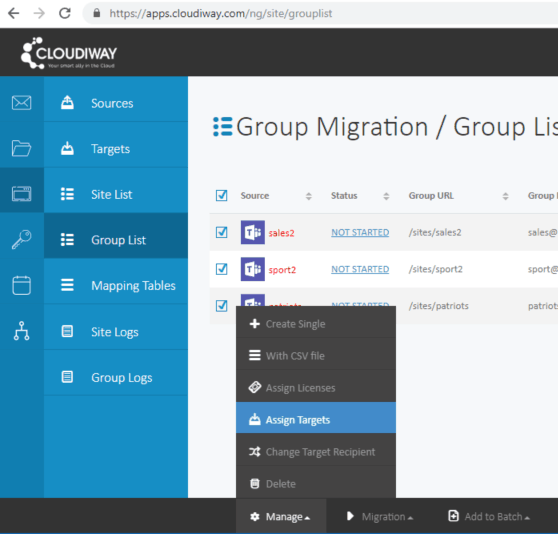 Cloudiway provides a preprocessing tool that will set automatically all the required permissions at the source and at the target and provision the groups and teams at the target. What does the preprocessing tool? It uses the graph APIS (Client ID and Client Secret) to give the migration account defined in the source connector the owner Role. This ensures that the migration account will have all the necessary permissions during the migration. 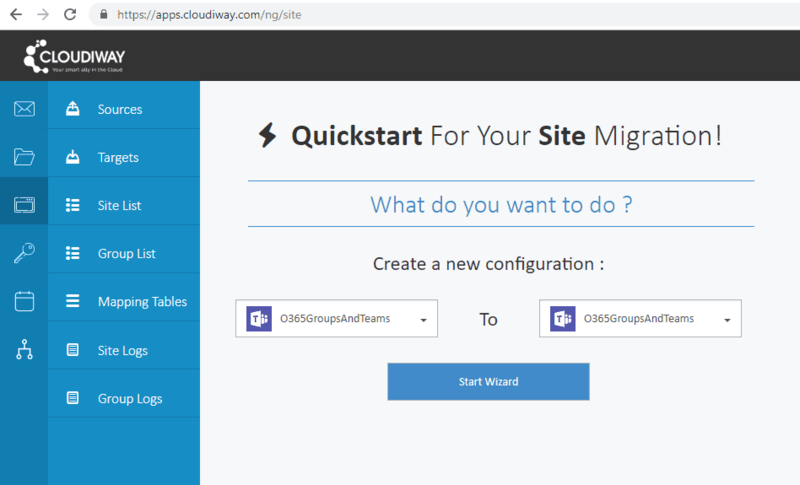 It creates the group or Team and the associated SharePoint modern site under the context of the migration account defined in the target connector. It sets all the members and owners to the group. It creates the additional SharePoint libraries that may have been manually created. At the end of the preprocessing, the status of the migration is set to “Not Started”. The group or team is now ready to be migrated. How to run the preprocessing? Select the groups or teams you would like to start preprocessing by clicking on their individual checkbox, or by selecting all groups and teams with the checkbox at the top of the list. 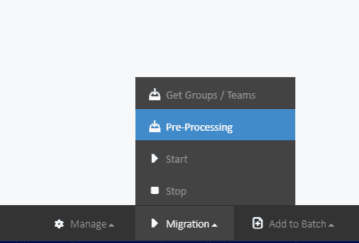 Click on Migration in the bottom left corner of the action bar and select Pre-Processing to begin the process. Click on the Site Data tab to see a list of what can be found in the site. Click on one of the plus signs to see further information about the page and its site content. With this level of detail about pages and contents, you can verify any troublesome items unlikely to be migrated prior to starting migration. You should also use the audit to cross-check any missing items from the audit that are present on your source site. 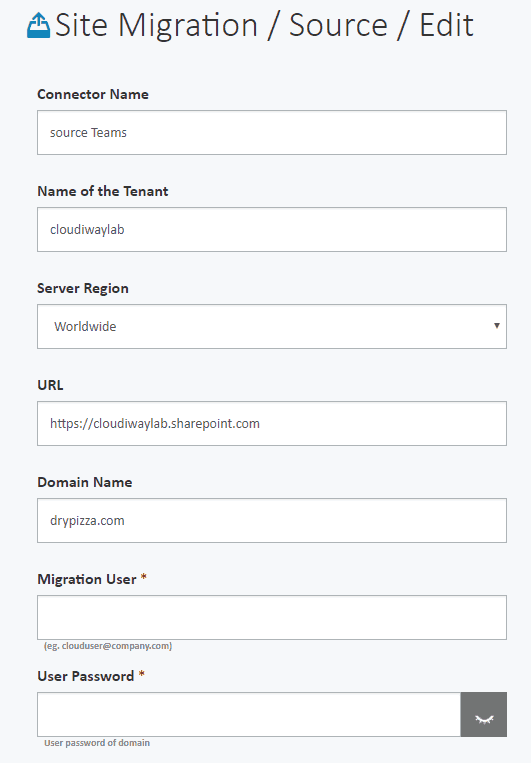 Now that you have performed all the pre-migration steps within your tenants and within Cloudiway, you’re ready to migrate. We recommend you run a test migration on a single site first to check that your configuration produces the outcome you expect. 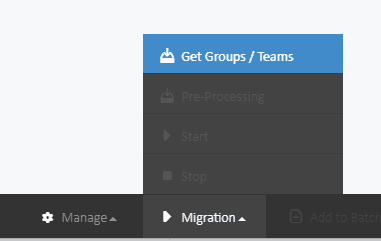 To start your migration, select the Group or Team you wish to migrate and click on the Start button. You batch will be scheduled and will begin as soon as resources are available. 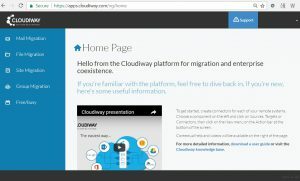 Cloudiway provides an extensive knowledge base with many resources, including common error messages, video guides and downloads. The knowledge base also contains information on how you can ask for further support, should you require it.